This week I had a number of ideas for the concept, so I decided to combine two of them into a simple picture made in Paintshop. At first, I thought about drawing this, but I think it actually works better this way - simpler and clearer - and I already drew a map by hand last week :). Great illustration. 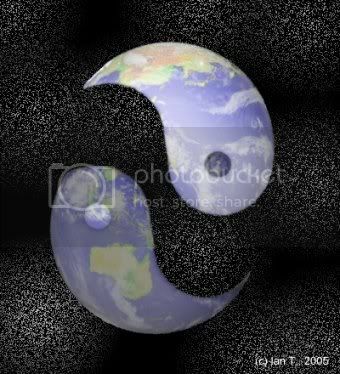 Earths yin and yang out of balance. Nice job. really wonderful! i like the colors and the shades are great. Beautiful!. I love how it looks like you didn't even make an effort. WOW, what a wonderful take on the theme. I like that the background has some texture but doesn't compete with the images. wonderful idea and execution. Great illo. It looks to me as if the earth is trying to regain its balance. woah, what a cool concept! Ian, I like this philosophical observation and how you've illustrated it. The background looks like the cosmos...in truth, although we are so small in relation to the universe, our world is all we have. Time to balance things properly and be whole again. Great illustration Ian - I like th concept and execution. Cool lights and shadows, nice texture too. Great job! Thanks for all the comments. The Unknown and Carla - you've got what I'd intended, though it's definitely an image that can be read a number of ways. Adobe (the makers of Photoshop, Illustrator, InDesign and Acrobat) bought Macromedia (Flash, Dreamweaver, Fireworks, Freehand). The main reason given for the purchase by Adobe was so they could integrate the PDF format of Acrobat with the SWF format of Flash. Both products' players have an incredibly high penetration on computers (somewhere around 98%)but neither product played well with the other. Now you have the combination of the two major players in the graphic/web design field becoming one company. I don't see how limiting the competition through a merger can possibly be good for the consumer. Of course, no-one asked me. Sorry if that's more than you wanted to know. This was really marvelous Ian. It's a wonderful concept executed beautifully!